The hippopotamus, if disturbed while mating, is not a happy bunny. Sugar almost learned the hard way, surprising a pair in the act while fishing from his mokoro in Botswana's Okavango Delta. One reared up in front of him, the other bore down from behind. For a horrible moment or two he thought his time had come but he managed to manoeuvre his canoe into the thick, long grass and the hippos quickly lost interest. Had one gone for him, it could have bitten him in two as easily as if he were a swizzle stick. He tells me this story as we glide across the inland delta in the brilliant light of early morning. It taught him, he says, to steer clear of the deeper channels, where hippos are more likely to be concealed. They copulate, give birth and nurse their young under water. We have to cross several such channels, however. So I ask him, when is the mating season? “Now”, he replies. We are on our way to one of the many islands formed as the flood which begins as torrential rain on Angola's Benguela Plateau ends its journey months as a shimmering network of rivers and lagoons in the Kalahari Desert, where most of it evaporates. This year's water levels are among the highest in 25 years. Sugar is our guide's Anglicised name, English being Botswana's official language. In Tswana is it Sukiri. He has been polling mokoros since he was seven, balancing at the rear like a gondolier. Traditionally, mokoros are dug outs, made using the whole trunk of a tree such as the mopane. But such trees can take 200 years to reach sufficient maturity and the government has been trying to discourage deforestation – so this one is fibreglass. The delta is a place of intense beauty. 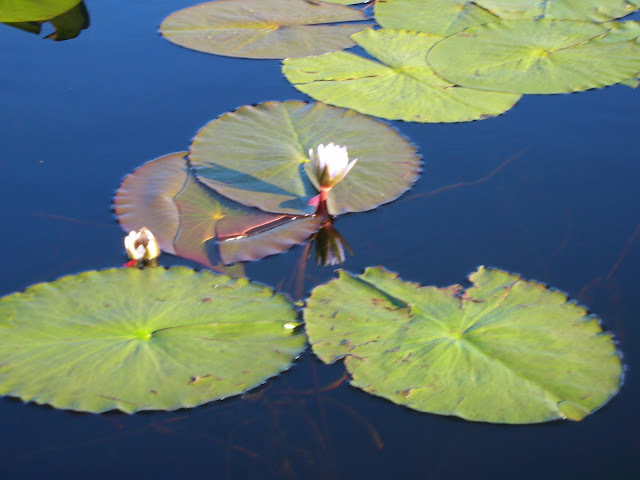 Lilies dot its placid surface. Their pads support the chestnut and white African jacana which stalks delicately on feet which evolution has stretched to spread their weight, appearing to walk on water. Hence its alternative name – the Jesus bird. The eye is caught suddenly by a tiny malachite kingfisher, with scarlet bills and flashing blue plumage. Crocodiles slide furtively from view at our approach. 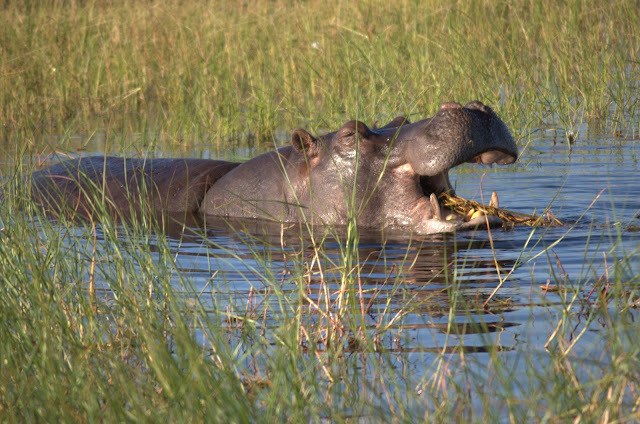 Hippos, observed from a respectful distance, feed noisily, on great bundles of grass. Sunset is a sudden fire, quickly extinguished. We watch it from the waterside bar at Eagle Island before being escorted back to our “tent” by a staff member, in case a dangerous animal has slipped into the camp. Tent is a loose description. It is an en suite thatched hut with a bed under a mosquito net, his and hers wash basins, air conditioning, a phone and a wooden balcony with loungers. This is not for those who feel camping should involve an element of hardship. The camp is one of three in Botswana run by Belmond Safaris. 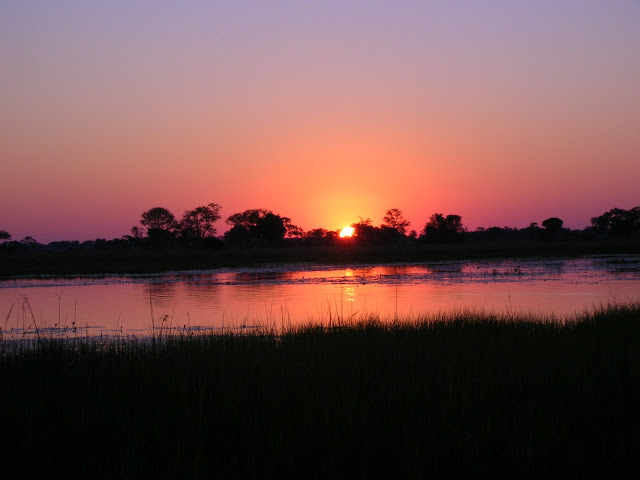 To reach them we fly overnight to Johannesburg, spending a day there and a night at their sister hotel, the tranquil and luxurious Westcliff, flying north next morning to the small delta gateway town of Maun and completing the journey by light aircraft. First stop is Elephant Camp, which is outside the delta on the enigmatic Savute Channel, which fills with water every 25m - 30 years or so. It is about due but during our visit it is dust dry and the herds of huge elephants which give the camp its name gather at artificial waterholes. On an afternoon game drive a keen eyed fellow traveller spots lion tracks and after a long search our guide spots a big male, lazing beneath a bush about 50 metres away. But male lions are the animal equivalents of couch potatoes and this one is true to form. We wait silently for maybe ten minutes in fading light before he deigns to raise his great head, allowing us a proper sighting. A short flight takes us to Khwai River Lodge, a camp on the edge of the delta. Sitting by the pool there with binoculars alone makes the stay worthwhile. A purple heron waits motionless for the flicker of fish. Red lechwe (antelopes) graze on the flood plain and the inevitable hippos lumber and snort through the long grass just a few metres away. Excursions with a guide known as KG and his dreadlocked trainee assistant Bob – after Marley, that is – prove even more rewarding. Towards dusk we find our first leopard, a female. slinking cooperatively close in the undergrowth with a cub. She seems totally unfazed by our presence or the clicking of cameras. Early next morning drive across a rackety wooden causeway into the Moremi Game Reserve, where we sight wild dogs stalking impala. “One of those impala is going to be someone's breakfast”, says KG, but they are too fleet of foot. They show the dogs, their black and white rump M markings – which guides call “bush McDonalds” - and go leaping off among the trees and scrub. The dogs turn their attention to a group of lechwe but are frustrated again as their intended prey splash into a small lagoon and stay there, defying their reluctant pursuers to brave the crocodiles. Days in camp begin at 6am, with coffee and biscuits delivered to our tent. Then it's a light breakfast at 6.30, of porridge, perhaps or the universal African staple, mealie meal, a game drive and a huge late morning brunch. Mornings are very chilly but by now it is hot and there are three hours or so to relax or swim before afternoon tea and another drive. Before each evening drive, evoking shades of colonialism, we are asked to order sundowners. One evening , as we stand by the vehicle watching two hippos scrapping in the river, KG pours an American lady companion an enormous beaker of white wine. “Now”, he tells her, “you will see pinky elephants”.